I find it ridiculously hard to pick favourites. This may have been a similar feeling for you as you cast your vote in the Reel Gospel Readers Poll. The fact that the readers’ film of the year was tied between two films shows there were a lot of well-loved films this year! For me, I’ve been agonising over this choice for my pick of Film of the Year as it hasn’t been totally clear until now which film, in my opinion, is best. Choosing from a shortlist of those eligible for votes (those released in 2013 and featured on Reel Gospel) made it even tougher. If I were to base it on star rating (which some of you might think I should) then my film of the year would be Captain Phillips – it’s the only film I saw in 2013 that I awarded a five star review. But as I mentioned in my review of that film, Captain Phillips made me feel stressed. It was an intense, but marvellous piece of filmmaking. But I love to relax and enjoy a cinematic experience, and one film stood out this year as a great ride. I’m pleased to announce that Star Trek Into Darkness is the Reel Gospel Film of the Year for 2013. In a year filled with science fiction and space blockbusters including Thor: The Dark World and Oblivion (I’m still devastated that I missed Gravity at the cinema), Star Trek Into Darkness stood out among the rest. It’s an action blockbuster courtesy of director J.J. Abrams and it’s stylised beautifully. I’m not a Trekkie but I found this film to be a real blast. Despite being a sequel, it improves on the 2009 reboot, and the visuals are magnificent. I haven’t seen colour used so well in film in a long time, and it actually enhances Abrams’ signature lens flare. The story is action-packed and the acting is brilliant – in particular Benedict Cumberbatch as the villain, and Zachary Quinto as the ever-evolving Spock. If you haven’t seen this flick yet, make sure you do. Honourable mentions go to The Way, Way Back; Captain Phillips and Iron Man 3. And in case you were wondering what my least favourite film of 2013 was, I’m going to say After Earth. Read my review to discover why. 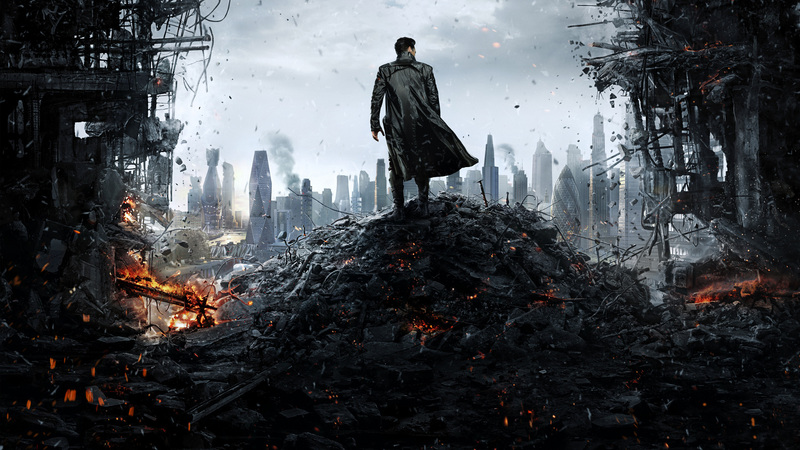 You can read my review of Star Trek Into Darkness from earlier in the year, here. Tomorrow on Reel Gospel I’ll announce the Reel Gospel Album of the Year. Star Trek Into Darkness is available on DVD and Blu-Ray on Quickflix. Posted in MiscTagged Benedict Cumberbatch, Best of 2013, Film of the Year, J. J. Abrams, Reel Gospel, Star Trek Into Darkness, Zachary QuintoBookmark the permalink.